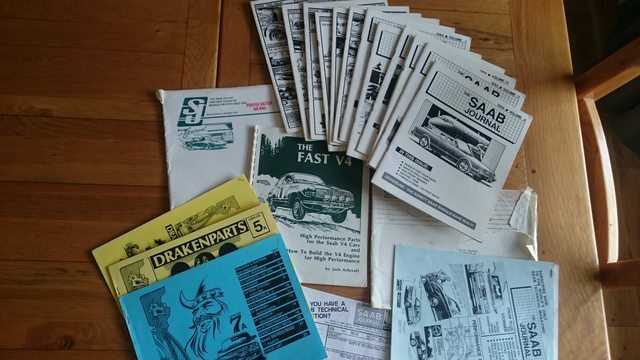 I've had some experience of overheating problems in cars of the same era as the strokers and early 96s, though not Saabs. Over the decades 'deposits' collect in the waterways, particularly in the head(s), where most heat is generated, and as the water passages narrow, the engine will begin to overheat under more strenuous conditions, and this 'bakes' on the deposits, and each subsequent overheating episode bakes on more deposits, so the overheating gets worse/more frequent. The gauge may be reading in the red, but the cylinders furthest from where the cooled water from the rad enters the head can be even hotter than the area where the temp sensor lives. Many people fit an electric fan which 'cures' the symptoms but not the underlying cause. I have spent a long time chipping these baked on deposits out of a cylinder head (and some from the block), which transformed a straight-6 engine from one which used to overheat for fun, into one which has never again - yet - overheated in UK conditions, WITHOUT the aid of an electric fan. So it is easy to see why a cooling system which is 'marginal' (or little better) by design can give us such problems. I suggest that it is possible - just 'possible' - that the condition of the individual cooling system is one of the reasons some people experience problems with overheating, while others don't, on the same model with the same or similar spec cooling systems. If the cooling system is marginal to begin with, then larger rad cores will usually help, as my chum with a Stag will attest (and most of us are aware of the Stag's reputation for overheating), providing that heat can be effectively removed from the engine bay. Triumph Stags do have a reputation for overheating, one of my very few favourite British cars. Would the Evans coolant actually make the engine run cooler, or just not boil? As I understand it, waterless coolant (which is not a coolant additive, it is an alternative substance to water) simply doesn't boil at the sorts of temps you find in an engine coolant system. So it doesn't cool your engine any better (in fact, from what I hear it is worse at transferring heat because of its lower specific heat capacity). Further, it is apparently more viscous than water (which is what water pumps are designed for) so flow rates are reduced. Engines running waterless coolant are known to run hotter from what I've read. It is, apparently, good for your engine (as having no water, the engine doesn't rust). However, I've also heard it is no good if you don't fully get all of the water out of the system, and as such (unless you're building a totally dry engine on the bench) it's not a DIY engine-in fix- you need to have it hooked up to a machine which circulates water removing chemicals. Having half a litre of water that will still boil in there will just spray your new waterless coolant out and continue to corrode your engine, rendering the exercise pointless. It's also flammable, so you want to be very careful if you have a hose burst next to the manifold. Then you need to carry either a few litres around with you at all times (or an RAC card), because if for any reason you experience any sort of leak you'll knacker the coolant if you top it up with water. I've never experienced any cooling issues with my own V4s, apart from when a cheap eBay head gasket blew (I'm using proper ones since!). I've worked on other V4s that suffered from overheating issues though; I remember a rad cap that didn't seal properly (rubber washer from the local plumber sorted that), stuck thermostats and a very poorly tuned ignition system that was in overall horrible condition. These are not problems inherent to the design of the system though, but maintenance issues. I have to say I always use 82˚ thermostats in V4s instead of the standard 88˚ stats. I think it's also a good idea to have the expansion bottle cap pressure tested occasionally and not to overfill the bottle (up to MIN is fine). The current engine in my 96 has a 99/900 (I think) electric fan to reduce strain on the balance shaft bearings and do its work when needed (mainly after switching the engine off on hot days/ after long hard drives), instead of when the engine happens to run. There is a light on the dash so I can monitor the fan and I have to say it hardly ever comes on. I've also installed an override switch that I've never used so far. Does anyone have below book? I'm curious what Jack Ashcraft has to say on the matter. There is no doubt the 96 V4's have marginal cooling capabilities with little forward movement of the vehicle in hot weather. I have never had any problems with them at say 5mph plus. It,s a real problem when stuck in traffic on a hot day which is why I have fitted Kenlowe fans before. I used to commute from Putney through Central London to Kentish Town in a Citroen Dyane and 96 V4. It was stop start pretty much all of the way BUT a hell of a lot better than having someone's arm pit crammed in your face on the sweltering tube. In say 25C plus heat for over an hour I never had any problems with the hateful Dyane but turning on the heater and pulling the bonnet lever on the 96 was a regular routine as well as all the people pointing out my bonnet wasn,t shut properly. I will be fitting a Kenlowe fan to mine on the odd occasion I am stuck on the motorway or queuing getting out of a car show. Will be interested to hear how you get on with it Steve. 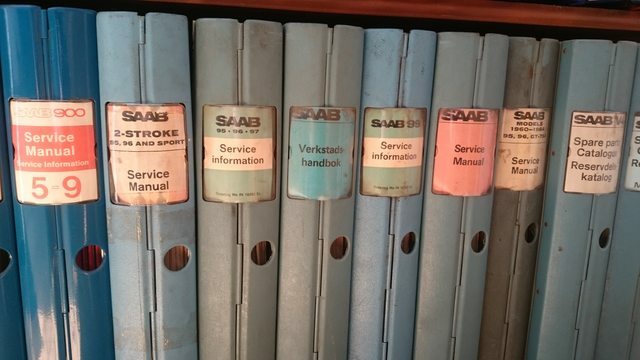 I have a file from a dealership that holds the internal correspondence from SAAB to each dealership regarding alterations to the vehicle and what the dealerships should do. As Kenlowe fans have been around since the 1950's I don't see a problem fitting them regarding keeping the car original. Good to know, didn,t realise that. NON-SAAB RELATED....AN ARTICLE I HAVE IN A MAGAZINE,FROM THE MID -EIGHTIES ? 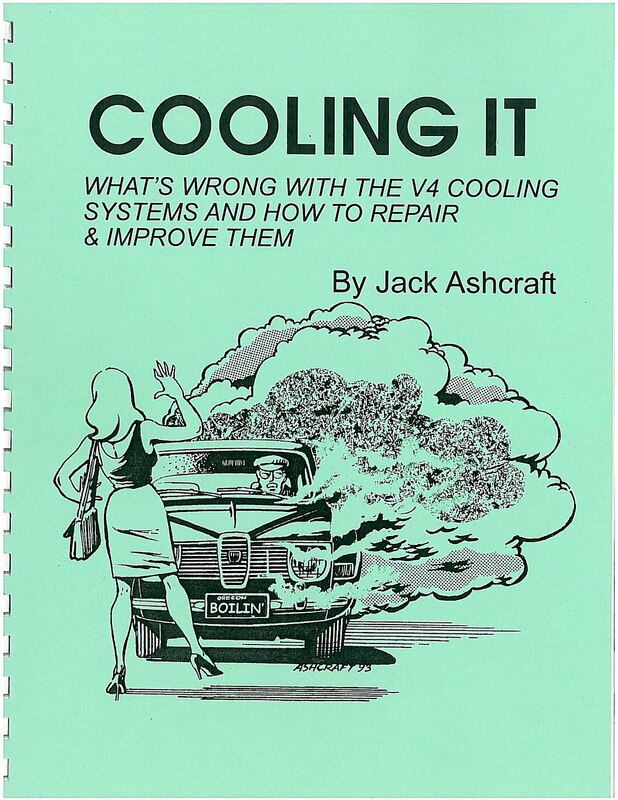 I did have the Ashcraft Cooling It book many years ago, but I let someone have a look at it and I never got it back. From what i can remember the gist of it was aimed at cars below the 48th parallel and hotter countries. He mentioned having the correct stat and pressure cap, he also mentioned corrosion around the water pump housing and how this increased area can affect pump performance. He seemed to focus more on performance engines and adding the 99/Sonett radiator, which is easy to do on a US spec car, but not so easy on the Euro spec. He offered an inline water filter, much like an oil filter cartridge, to add to your cooling system, he also sold these through his catalogue. A point to bear in mind is Saab continued with the V4 cooling system, pretty much as designed, right up until the demise of the V4 up until 1980. 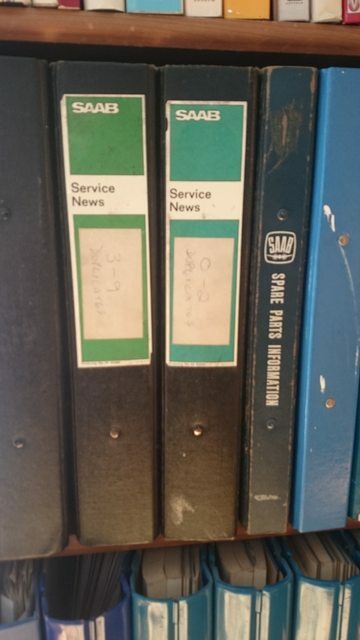 99 EMS: I have been looking for V4 Service Information/ Service News books for my website for ages; if it's not too much trouble I would be very grateful if you could scan them so the information becomes available for all to enjoy! Ashcraft is very good a marketing the parts he sells, even in books that people also pay for; he would have done pretty well in an advertising agency that's for sure! 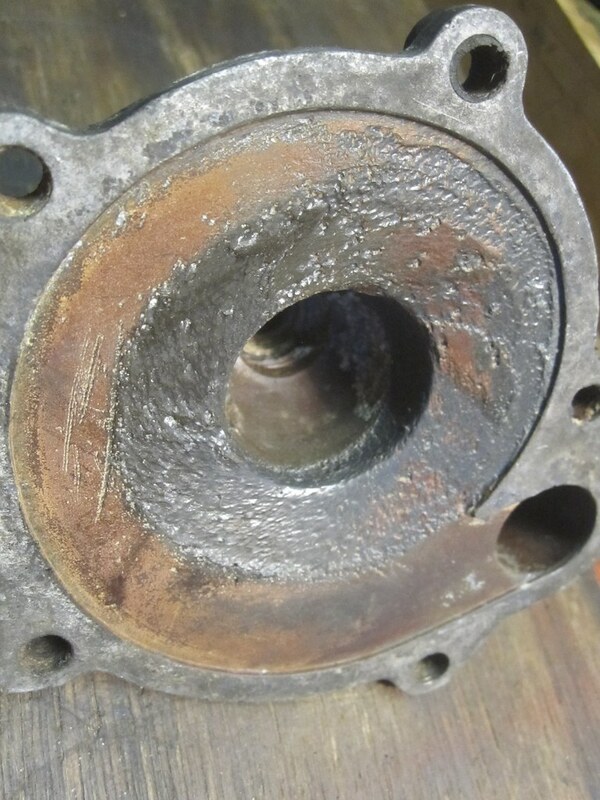 Erosion due to cavitation (imploding air bubbles) in water pumps (impeller, timing gear cover and pump cover can all be affected) can be a serious issue. Not much you can do about it I think, it's probably inherent to the design, but I wonder why it's worse in some engines than in others? Do we have someone knowledgeable in fluid dynamics aboard? That looks like sucction cavitation to me, which is caused by the pressure at the inlet being too low allowing bubbles of vapor to form. As these are compressed in the pump they collapse and this collapsing causes a shockwave bamaging the impeller and the housing. Generally caused by a blockage upstream of the pump, although as we are on a loop upstream and downstream are the same if you follow the system far enough. I'd say that there is too high a pressure drop in the system for the pump to handle, and that its operating closer to the lower end of its curve than the upper, hence suction cavitation not discharge cavitation which is caused by too high a pressure dowstream. Some engines possibly suffer more than others because the water channels are smaller (manufacturing differences, flashing etc) giving a bigger drop. Having blocked anded corroded pipes wont help. Running the pump slower with a larger pulley will help the cavitation as pressure difference is a function of speed difference squared, but may result in not enough fluid being moved around the engine to cool it properly, and higher water temps. But the reduction in cavitation may make the pump operate more efficiently and increase water flow lowering water temps. Reving the engine higher will increase cavitation, so the variation between engines could be due to driving styles. The advantage of the Evans coolant is that boils much higher, so if your system is marginal it will let you run hotter without boiling which reduces performance of the cooling system. More modern systems also achieve this through higher pressures in the water pipes to change the boiling temp of the water. The disadvantages of the Evans is that it is less efficient than water at heat transfer and capacity, so your engine will run hotter increasing the risk of knock and its higher viscosity will encourage cavitation in the water pump. IMO the Evans solves the symptoms, not the cause. If youve got problems with high temps then you need to check the system. Check for errosion in the pump which will lower pump performance and indicates problems with pressure drop in the system, check for blockages from crusty bits and deposits and airlocks, and if necessary increase the size of the radiator. You shouldn't need a cooling fan when driving at speed as the airflow from the motion of the car will be greater than that which can be pulled through by the fan. If you do then there its a problem with the system as above, or there isnt enough airflow through the grill in to the radiator, or it cant escape the engine bay to let more fresh air in (more likely with our enclosed engine bay floors), which is why Saab had the "Safari Vents" and extra holes in the wheel arches for hot countries and motorsport. If you are overheating at idle only then its the same but its the fan that isnt coping. It may be that the rest of the system is still the problem, but fitting an electric fan may be the easier "fix". My plan for Dusty is to check the water paths for flashing and small sections as far as possible and fix where needed, clean off the calcium buildup in the pump etc, but also to fit a bigger radiator and an electric fan. The electric fan has the advantage of only coming on when the water temp is high enough to need it, improving warmup times. I'm toying with fitting Safari vents because i like the look, but it is more work. Some engines possibly suffer more than others because the water channels are smaller (manufacturing differences, flashing etc) giving a bigger drop. I meant to say "I wonder why it's worse in some V4s than in others? ", i.e. in identical engines. I also wonder why in some V4s it's the impeller that's completely disintegrated, whereas in others the pump housing part of the timing gear cover or the pump cover are the worst affected parts. I have some great examples from different engines in the workshop. Having blocked anded corroded pipes wont help. That sounds like a plausible cause. No 2 engines will be completely identical. There will be missmatching flashing internally where cores meet inside, depending on how careful the person assembling thr mould was, how worn the core boxes were, and even how well they were made in the first place. This was all pre cnc cut tools, it would have been cut by a pattern maker with a chisel. Hence needing to port and polish engines to get the best performance. Theres all sorts of little lips, steps and joins inside, and it will be worse for the water channels where they are even more enclosed. Its all cavitation. Theres so many variables that determining why one part suffered more than another on a particular block is impossible. Could be different variants of pumps, or block tools, or maybe different grades of metal in the parts meant some bits were more prone at different times. Sounds like the pump is mismatched to the block though. There are pumps with different design impellers (straight and curved vanes, different number of vanes, even different diameters) on the market, some allegedly work better than others. Definately. They may have completely different characteristic curves for flow vs pressure. I doubt very much I will ever get round to scanning these, however you are quite welcome to collect them and scan them yourself, a deposit would be required. I don't venture up north that much, but I'll keep your offer in mind for when I do! On the v4 The green rally car had a modern 3 core rad, looked the same and just and I mean just kept the temp down with 145 bhp. This set up I run in my road 140bhp version with an electric fan and a stat and it is bang on normal. I would get your rad re-cored with a more efficient modern core, it will look no different to normal. The water pump on a 2 stroke can be machined down closer to the impeller which improves flow on bullnose models or fit a bosch electric booster pump. Also there were two bullnose block input housings and one is larger. To be honest the next engine I build will have the core plugs tapped out and three water inlets under the exhausts and the temp down to 70. And it will be setup on the dyno, then I am rounding off all the fixings so Mr Pinkett carnt mess with it. Other main problem on v4s is seeping head gaskets on the back cylinders. This results in coolant blowing out of the expansion bottle. I tested loads of expansion bottles and due to manufacturing tols some don't hold pressure at all. Quick solution is some 3mm silicone rubber sheet cut with a hole in the middle so it seats between the cap and bottle, the hole is for the air to get back in under cooling. Also the system does not self bleed. This can be solved by fitting a motorsport or a header tank from another car which retains the lower pipe fitting, but uses a 6-8mm bleed pipe that needs fitted to an adaptor in the very top of the rad top hose to the top of the expansion bottle. The works cars had there expansion tanks above rad height with a big feed fro the very top of the rad. Any air just ended up in the wing mounted header tank.